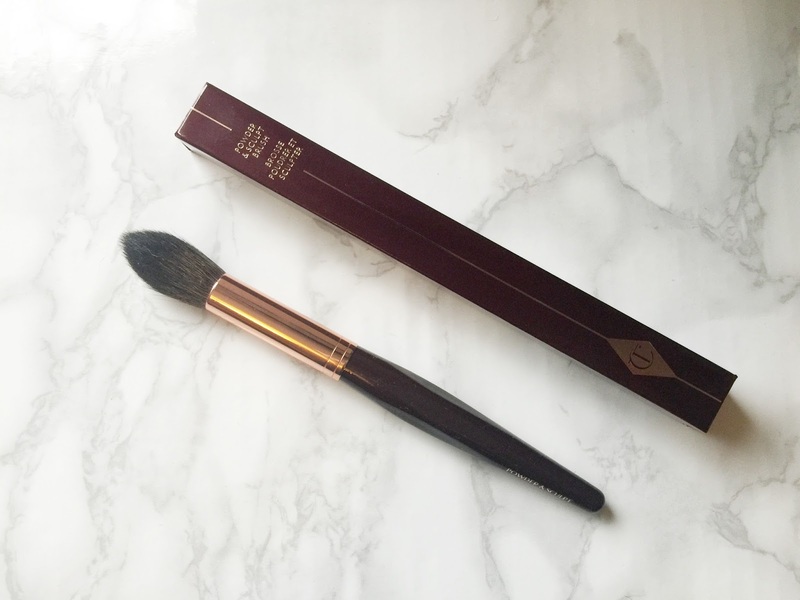 I bought this Charlotte Tilbury Cheek and Sculpt brush after watching a YouTube video on the Charlotte Tilbury channel. As you may know from my previous reviews and hauls, I seem to collect makeup brushes like they're going out of style, so it didn't really take much persuasion to make me buy this brush. In the video that I saw Charlotte was using this brush in a video where she did Olivia Culpo's makeup. The video was just so refreshing to watch, and that makeup look was stunning, so naturally I had to go ahead and treat myself not only to this brush, but to every other makeup product that she used in the video! In the video she used this Cheek and Sculpt brush when she was going in with her stunning Filmstar Bronze and Glow product and I was immediately sold on it. I can remember her lightly dabbing the brush into the contour shade and then saying her famous catchphrase, "Follow the hallow", meaning under the cheekbones and I couldn’t deny that it looked absolutely gorgeous. Before she had even finished applying the product, this was already in my cart and I was the proud owner of this brush and it arrived with me the following day and I have been using it ever since. Thanks to the small and not overly fluffy bristles it applies the product precisely to the area where you want it, but because it is tapered it helps to defuse the product evenly and help to get a natural and soft contour. Before I had this brush, I used the Real Techniques Blush Brush, which is a large tapered brush and as great as it is, it can make the contour look too large and sometimes choppy and that is why I am so happy that I have upgraded to this Charlotte Tilbury Cheek and Sculpt Brush. I am sure that you have seen if you are a beauty addict like me, that Charlotte Tilbury makeup has truly taken over and it has reached a whole new level of popularity. I feel like the brushes really are quite understated against the rest of her makeup line, but I love the quality of this brush and I find myself reaching for it on a daily basis. After trying out this brush, I really want to try out more by Charlotte Tilbury to see if they are of the same quality and if I notice a difference switching from my old brushes to these, plus I think that I am well overdue an upgrade on some of the brushes that I own! So, I have been using this brush for around a month or so now and I have used it every single day and cleaned it regularly and it still looks absolutely brand new. Also, through all of the times that I have used this brush, I haven't notice one single hair shed from the brush, which is a very good feat for any makeup brush. I have found that even some of my most expensive makeup brushes malt, including my MAC brushes, sometimes with the MAC 187 the malting can be so bad that I have to pick the hairs off my face using tweezers! I am pretty sure that I paid around £35 for this brush, which I think for a high-end brush from a brand that I absolutely love, I think is a very reasonable price. I know that £35 is hell of a lot of money for a brush, I completely get that, but when you think about how much use I will get out of this brush and how long it will last me, it really works itself out very well. Plus, with the quality of this brush, I am more than happy to spend my hard-earned cash on it! Plus, aside from contouring my face, I have found so many more uses for this brush and each and every time it does an incredible job. I have used this to powder and set my entire face and even to highlight and it does such an incredible job every single time. I think that this is a great brush for travelling with because it is such a versatile brush and a great addition to my ever-growing collection. If anybody wants to check out this brush, I will leave a link to it down below. Make sure to leave me a comment and let me know if you have tried this brush and let me know what you thought about it! I'm glad to hear that this performs to match it's price tag, I don't usually spend too much on brushes but I love a good tapered brush so definitely going to check this one out! I really do think it is worth the money! I so very nearly bought this last week on Cult Beauty then decided I couldn't part with the money for one brush but it sounds and looks amazing! I might still buy it! I really do think that it is worth the money, I have used it everyday since I first bought it!